Part 2 (Boston Public Market): New indoor Market. 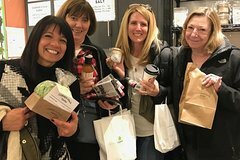 Vendor meet-and-greets and several tastings, including lobster roll, apple cider doughnut, Vermont-made infused maples syrups, drinking vinegars/shrubs, and roasted nuts. This walking tour begins in the lobby of the Bostonian Boston hotel at 9:45 a.m. Sundays, and at 10:00 a.m. the remainder of the week. It generally runs 3 hours. The route itself is no more than a mile, entirely located in the central area of the Market District and the North End. All stops are handicap accessible, with the exception of one basement bakery. Our tour route will bring us through the historic, 200+-year-old outdoor Haymarket Market (Fridays and Saturdays only). Our first stop is the two+-year-old, indoor Boston Public Market, which is a must-visit, whether a local or a visitor to Boston. The Market is comprised of up to forty local food vendors, some of whose stories we'll hear firsthand. We'll also enjoy tastings throughout, including a popular, largely-regional doughnut*, infused maple syrups, roasted nuts, and drinking vinegars. And how could we forget seafood? Will a lobster roll tasting at a Best of Boston Fish Market do? We thought so! In the North End (Little Italy), we'll visit THREE Best of Boston winners: a lines-out-the-door sandwich shop, a THREE-TIME Best of Boston Bread Bakery, and an award-winning pastry shop. And we'll enjoy freshly-made cheese in a *very* hidden Old World salumeria featured on Travel Channel's "Zimmern's List". You're not afraid of alleys, are you? Our finale? Cannoli, of course!